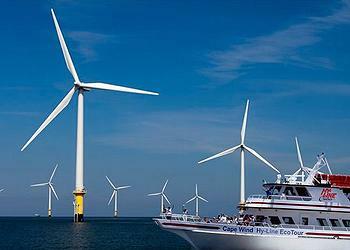 WASHINGTON, DC, March 14, 2014 (ENS) – Both sides in a lawsuit over the permitting of the first U.S. offshore wind farm, Cape Wind, are declaring victory after today’s rulings by the U.S. District Court for the District of Columbia. Cape Wind would generate power from 130 wind turbines, each standing 440′ tall, covering 25 square miles of Nantucket Sound. The developer is the Boston-based company Energy Management Inc. Currently in its financing phase, Cape Wind has been fully permitted and its Construction and Operations Plan has been approved by the U.S. Department of Interior. In a set of legal victories for the federal government and for Cape Wind, District Court Judge Reggie Walton today issued rulings against project opponents in their four lawsuits challenging Cape Wind’s permitting approval. Judge Walton upheld the Department of the Interior’s review and approval of Cape Wind, a comprehensive permitting process that spanned 10 years, rejecting the plaintiffs’ request to vacate the Cape Wind lease. Judge Walton rejected many of the legal claims raised by challengers, including arguments over navigational safety, alternative locations, alternative technologies, historic preservation, Native American artifacts, sea turtles, and the adequacy of the project’s environmental impact statement and biological opinions. However, Judge Walton asked federal agencies to clarify their findings on the impacts of the wind farm on critically endangered North Atlantic right whales and migratory birds. While the court upheld the decision of the National Marine Fisheries Service that impacts of the wind farm on right whales would be “insignificant or discountable” and that whale presence would be “rare, sporadic and extremely limited in duration and frequency,” it directed the agency to issue a statement of the number of potential whale incidents that would require further consultation with the agency. With respect to the Fish and Wildlife Service, the court directed the agency to confirm that its decision regarding a proposed operational restriction was arrived at through an independent determination. The four legal challenges to the Cape Wind offshore wind farm decided today were filed in 2010 by Alliance to Protect Nantucket Sound, the Town of Barnstable, the Aquinnah Wampanoag Tribe and the Public Employees for Environmental Responsibility. They challenged Cape Wind’s permitting approvals by federal agencies on the grounds of the National Environmental Policy Act, the Endangered Species Act, the Migratory Birds Treaty Act, the National Historic Preservation Act, the Outer Continental Shelf Lands Act, the Coast Guard and the Maritime Transportation Act of 2006. Calling today’s rulings “a landmark win for the environment,” the challenging groups were pleased that federal agencies must to revisit Cape Wind’s impacts on migrating birds and endangered right whales in Nantucket Sound. Judge Walton ordered the Fish and Wildlife Service to evaluate a shutdown of turbines during migratory bird season to reduce bird mortality. Cape Wind has resisted the measure, arguing that it would destroy the economic feasibility of the wind farm. He ruled that the National Marine Fisheries Service must formulate and issue an incidental take statement regarding North Atlantic right whales. WASHINGTON, DC, March 14, 2014 (ENS) – The U.S. Environmental Protection Agency and BP today executed an agreement resolving all suspension and debarment actions against BP that prohibited the company from doing business with the federal government after the company’s guilty plea in the Deepwater Horizon disaster. The largest accidental marine oil spill in the history of the petroleum industry, the Deepwater Horizon oil spill began on April 20, 2010 in the Gulf of Mexico on the BP-operated Macondo Prospect. The explosion and sinking of the Deepwater Horizon oil rig claimed 11 lives and injured 17 workers. More than a mile below the surface, a sea-floor oil gusher flowed for 87 days, discharging 4.9 million barrels, until it was capped on July 15 and finally sealed on September 19, 2010. Effective immediately, the administrative agreement reached today will be in place for five years. The agreement provides that BP must continue safety and ethics improvements in order to comply. Under the agreement, BP must retain an independent auditor approved by EPA who will conduct an annual review and report on BP’s compliance with the agreement. There are provisions addressing ethics compliance, corporate governance, and process safety. The agreement provides EPA with the authority to take corrective action in the event the agreement is breached. EPA coordinated this matter with the Department of Interior, Defense Logistics Agency and the U.S. Coast Guard. Since November 2012, EPA has suspended 25 BP entities and disqualified BP Exploration and Production, Inc. from performing federal contract work at its corporate facility in Houston, Texas, stemming from its criminal conviction in the U.S. Government’s Deepwater Horizon case. Suspensions are issued where there is an immediate need to protect the public interest supported by adequate evidence. The suspension did not affect existing agreements BP had with the government. WASHINGTON, DC, March 14, 2014 (ENS) – Consumer protection and environmental advocates filed a lawsuit in federal district court against the U.S. Food and Drug Administration for failing to respond to a July 2011 petition in which the groups asked the agency to give consumers clear, accurate and accessible information about toxic mercury in the seafood they eat. The lawsuit was filed Monday by Earthjustice on behalf of the Center for Science in the Public Interest and the Mercury Policy Project, a project of the Tides Center. The groups are seeking a court-ordered deadline for FDA to respond to its request that the agency require package labeling and clear point-of-sale charts at grocery stores and fish markets so consumers can make healthier seafood choices that maximize the benefits of eating seafood while reducing the risk of mercury exposure. Under its own regulations, FDA had 180 days to respond to the petition, but ignored that deadline. The groups claim the agency’s failure to issue a final decision violates federal law. Mercury exposure via seafood consumption has been a health concern for decades. Originating mainly from coal-fired power plants and artisanal and small scale gold mining, airborne mercury is deposited into the ocean, where it converts into methylmercury, a neurotoxin that is particularly harmful to developing fetuses and children. Methylmercury accumulates in fish and shellfish. Methylmercury exposure has been linked to learning disabilities, lowered IQ, and impaired cognitive and nervous system functioning. The online advisory, “What You Need to Know About Mercury in Fish and Shellfish,” is aimed at women of childbearing age, pregnant and nursing women and children. It established guidelines for seafood consumption to minimize mercury exposure. The groups claim the advisory is inadequate. While it advises such women and children not to eat shark, king mackerel, tilefish, or swordfish, top predators that accumulate large amounts of mercury in their tissues, it offers little information about healthier alternatives. The groups warn that advisory encourages people to consume canned tuna, the largest source of mercury exposure for most Americans. Also, the groups say the information in the government’s on-line advisory is not reaching the general public, particularly those without Internet access. ANN ARBOR, Michigan, March 14, 2014 (ENS) – Eggs of invasive Asian carp, including late-stage embryos nearly ready to hatch, were recently identified in samples collected by U.S. Geological Survey scientists in 2013 from the Upper Mississippi River as far north as Lynxville, Wisconsin. Lynxville is on the east bank of the Mississippi in southern Wisconsin. The eggs and late-stage embryos were 250 river miles upstream of previously known reproductive populations in the river. Spawning would have occurred upstream from this site. During the 1970s, bighead and silver carp were imported into the United States for use in aquaculture production of food fishes and biological control of plankton in aquaculture ponds and sewage treatment lagoons. Within 10 years, the carp escaped and spread to the waters of the Mississippi River basin and other large rivers. The carp are in direct competition with native aquatic species for food and habitat. Their rapid population increase is disrupting the ecology and food web of the large rivers of the Midwest. The Asian carp eggs and late-stage embryos were discovered two weeks ago while processing samples that were collected in mid-May and mid-June 2013. 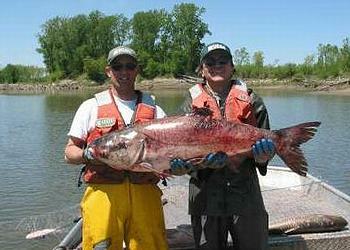 The samples were taken as part of a larger research project designed to identify Asian carp spawning habitats. Once the scientists visually identified the eggs, they examined other samples taken from the Mississippi River and found Asian carp eggs at seven locations between Pool 19 near Keokuk, Iowa, and Pool 9 of the main channel of the Upper Mississippi River near Lynxville. Iowa, Missouri, Illinois, Minnesota and Wisconsin border the navigation pools where these samples were collected. The eggs and late-stage embryos were identified as bigheaded carps – either bighead carp or silver carp – through visual analyses of specific features of the eggs and embryos. The USGS attempted genetic analyses to definitively determine which species of Asian carp the eggs belong to, but the results were inconclusive. Genetic confirmation is still underway, with results are expected in one to two weeks. The research is being coordinated by the USGS in collaboration with Western Illinois University. Scientists plan to collect additional samples from the Mississippi River this year as part of the on-going research project. For more on Asian carp research, visit the website of the Asian Carp Regional Coordinating Committee, ACRCC, a partnership of federal and state agencies, municipalities and others, led by the White House Council on Environmental Quality. SAN FRANCISCO, California, March 14, 2014 (ENS) – The Center for Biological Diversity reached a settlement agreement Tuesday with the California Department of Parks and Recreation that will increase protections in the Santa Cruz Mountains for the marbled murrelet, an endangered seabird that nests in old-growth forests. The settlement requires the agency to reduce dangers posed by visitor trash, which harms murrelets by unnaturally increasing the abundance of predators that eat eggs and chicks. In June 2013 the Center filed suit challenging the state’s protections for marbled murrelets under its new management plan for Big Basin Redwoods State Park, a heavily visited park that supports the largest remaining old-growth nesting habitat in the central coast region. Visitor garbage in campgrounds and picnic areas in Big Basin, Portola and Butano state parks has led to unnaturally high densities of ravens and Steller’s jays that eat murrelet eggs and chicks. Scientists have found that high nest predation is a primary factor driving the declines of murrelets in the region. Today’s agreement requires comprehensive trash management requiring animal-proof food-storage lockers at all campsites, installation of indoor dishwashing stations, and increased trash pickup to prevent dumpster overflow. It requires extensive public outreach that makes the murrelet a focal point of the parks, including signs, displays and videos in English and Spanish in all visitor areas to inform the public about how to avoid harming murrelets. It also requires annual monitoring of marbled murrelet status and predator numbers and a comprehensive assessment every three years requiring further action if murrelet status does not improve. Marbled murrelets are one of California’s most unusual seabirds, flying from the ocean to nest in ancient coastal redwood forests. They lay a single egg and rear their chick on the thick, mossy branches of old-growth redwoods and firs. Marbled murrelets have been called the “enigmas of the Pacific” because their old-growth nesting sites remained undiscovered by scientists until the 1970s. The marbled murrelet is listed as endangered under the California Endangered Species Act and as threatened under the U.S. Endangered Species Act. There are only about 450 murrelets in the Santa Cruz Mountains region, making this the most endangered and southernmost population on the West Coast. The population has lost 95 percent of its old-growth habitat due to logging, and most remaining nesting habitat is found within the three redwood state parks: Big Basin, Portola and Butano. CYPRESS, California, March 14, 2014 (ENS) – With a fuel efficiency of 74.1 mpg, Aaron Gold of the information website About.com, driving his green 2014 Mitsubishi Mirage, finished Thursday with the most miles per gallon in the Mitsubishi Motors Extreme MPG Hypermiling Challenge. Slow-racing their 2014 Mitsubishi Mirages, three automotive journalists were competing for a cash prize to be donated to a charity of their choice. 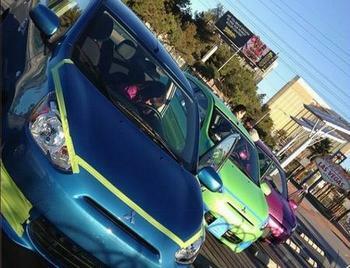 Following Gold in the 275-mile journey from Las Vegas to the Mitsubishi Motors North America headquarters in Cypress, California was Mike Austin from “Popular Mechanics” magazine in his purple Mirage and Joni Gray of the automotive media and marketing services company Autobytel in her blue Mirage. Austin and Gray tied for second place with an average fuel economy rating of 68.5 mpg. For Gold, as winner of the challenge, $1,500 was donated to the National Multiple Sclerosis Society, his chosen charity. Driving on behalf of the Wounded Warrior Project, Austin earned the veterans service organization an award of $500. Gray’s charity, TJ’s Dream Team, scored $500 to benefit brain cancer research. “This was such an exciting event, to have such knowledgeable colleagues in our industry to push the limit to see how high of an mpg can be achieved in our 2014 Mirage,” said Don Swearingen, executive vice president of Mitsubishi Motors North America. Participants were only allowed to make very minor modifications to their cars from production form. All three tried to reduce aerodynamic drag by taping the gaps between the hood and the fenders of their cars. With a starting suggested retail price of only US$13,000, the fuel-efficient 2014 Mitsubishi Mirage, with continuously-variable transmission, carries an EPA-rating of 40 mpg combined, while it gets 37 mpg on city streets and 44 mpg on highways. Look for the nationally-syndicated program “Cars.TV” to air an episode on the Mitsubishi Motors Extreme MPG Hypermiling Challenge. In February, the 2014 Mitsubishi Mirage 5-door hatchback took overall top honors in Cars.com’s latest “Top 10 New Cars for Penny Pinchers” list. Cars.com utilized key data points in its assessment, including a vehicle’s starting price, combined EPA fuel mileage rating and estimated cost for fuel over the first eight years of ownership to determine its rankings. In the eight-year cost for fuel metric, Cars.com calculated that the 2014 Mitsubishi Mirage would save drivers nearly US$1,000 in fuel costs when compared to the vehicle that finished in second place, the Chevrolet Spark, which is rated at 34 mpg, and more than US$2,000 over many of the other “Top 10” finishers.